This is a summary for Brinley from 26.5 months to 27 months old. Sleeping was great and normal. We have been keeping her warm enough in her PJs at night for the cold weather. Eating continued on as usual. She is improving on the throwing food. The hands up in the air helps. She has kind of moved on to squishing food when she is done. She has always loved to get her hands messy and dirty. I am trying to give her substitution for this sensory experience–playing with playdough and other sensory things. I need to get more on that. I, myself, do not love my hands dirty, so it is a hard thing for me to wrap my brain around. Playing was good other than the fact that she got a cold and was pretty grumpy for the first couple of days. She was more prone to do what she shouldn’t do and just seemed to want to irritate people. This really made me reflect on when McKenna was this age. She was always testing boundaries it seemed and loved to get a rise out of people. She also always had double ear infections. Always. It wasn’t until we got tubes in her that she got a lot better. I just feel bad for her that she was in enough pain that much for it to impact her personality like that for months. One day, our power was out for scheduled maintenance. It was out right when it was time for her IPT in the morning. Her room at that time of day doesn’t have a ton of natural light coming in. Kaitlyn and McKenna’s room, however, does. So we went for it in that room. She did quite well! She spent the first 30 minutes as good as can be, then she started opening and closing the door over and over, then she finally came out. I had to tell her to go back. I thought it was pretty good for being in a different place. Like I said, she got a cold. I have noticed in myself, the pain of the cold is really the worst right before and then the first day or two of the cold. I don’t like taking medication, so for years I would hold off in case the pain and pressure got worse, because colds last a long time. Once I noticed the pattern, however, I started allowing myself to take medicine for the first two days, and it really makes it so much more pleasant! All I need is the two days and then I can handle it. So since she was grumpy, I gave her some pain killer for two days (since decongestants aren’t available for her age…I think? Is she old enough now?). During this time, we removed her rocking chair from her room and added in a doll house that was in Kaitlyn and McKenna’s room. She loves that doll house and was really the only one who played with it, so it just made sense for her to have it in her room. She loves her new setup! I think she feels more like a big girl. This has been a new, frequent question from her lips lately. Many times when she is told no, she will respond, “Why?” or “Why not?” Funniness. Brinley had a lot of fun at Halloween. 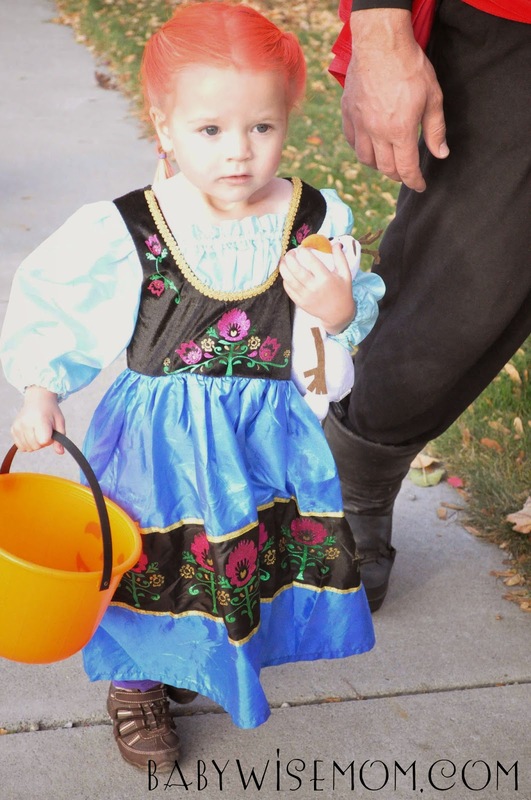 She of course loved going to the neighbors’ houses and getting candy. She walked most of the way. She loved dressing up in her Anna costume (yes, we joined the ranks and did Frozen this year). Brinley really wants to be a big kid. She wants to be treated like a big kid. She wants to do all they do. An hour long walk sounds lovely, but long for little legs 🙂 Does she walk, or ride in the stroller, or maybe a combination? I would love to have my daughter walk more but she claims to get tired very quickly. She rides in a stroller. When we get back, she and the other children get out and play for a bit. She is definitely too young to walk as far as we go the whole time. You'd be surprised- my 26 month old easily manages a 1 hour or longer walk. He's a boy though- maybe he has more energy! We have a large group of moms and keep a pretty rapid pace. She wouldn't be able to keep up.